Operating Temperature: 15-32°C. Storage Temperature: 0-32°C. Supported OS: Windows XP+, Mac OS X 10.6+,Linux Ubuntu 12.10+. Supported File Types: STL, OBJ, DAE, AMF. Included items: Spool holder, Glue stick, Power supply, USB cable (for firmware only), Test print, Hex wrenches, Grease. Supported Filament: PLA, ABS, CPE. Max Layer Resolution: 20 microns. XY Positioning Precision: 12 microns. Z Positioning Precision: 5 microns. Print Speed: 30 mm/s – 300 mm/s. Travel Speed: 30 mm/s – 350 mm/s. Filament Diameter: 2.85 mm. Nozzle Diameter: .4 mm. Heated bed smooths prints and allows for ABS printing. For 3D printing experts exploring 3D printing frontiers. Print in two colors through precisely aligned dual nozzles, without swapping filament or pausing your print. MakerGear M2 is the low maintenance 3rd generation 3D printer. Box contains M2 welcome package; M2 tools package; M2 miscellaneous package; M2 spool holder with screws; M2 power supplies, power cords and USB cable; spool of PLA; sample prints (fully assembled only); M2 printed parts package; M2 hardware package (no picture). Black powder-coated rigid steel frame. CNC machined black anodized-aluminum axes mounts. Precision X and Y linear rails. Precision ground and polished steel shafting. 4-start lead screw with integrated NEMA 17 stepper. Platform heater included. includes 1K spool of 1.75 millimeters PLA plastic filament. The plastic handle, extruder mount, spool holder and other plastic parts used on M2 are all printed in-house on production M2 machines. The power supplies work in the US and internationally (local plug is included). Six-month limited warranty. The MakerGear M2 is manufactured in NE Ohio. Open Design. No Proprietary Filament Cartridges. 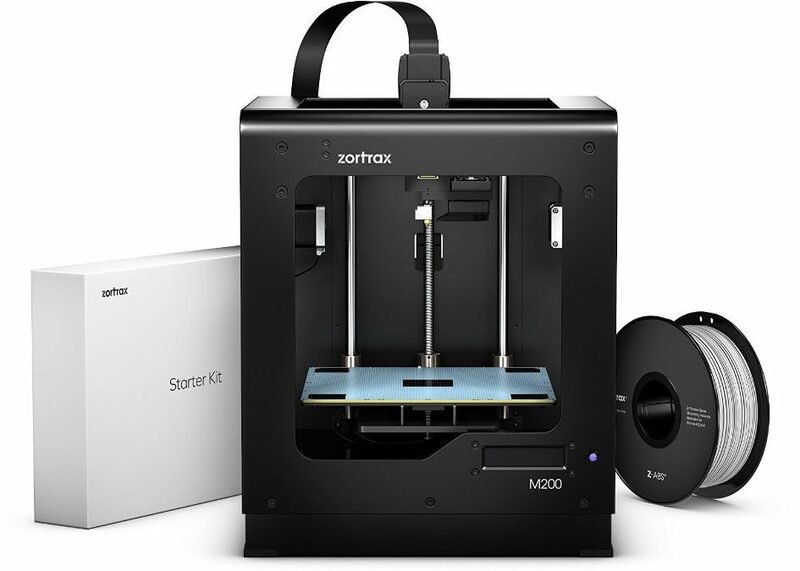 Zortrax M200 3D Printer with one spool of white Z-ABS filament. Plug and Print: Start printing in minutes. Many Printing Materials: Choose a variety of materials to print your model. Compatible with any operating system and any 3D modeling software. Craftbot is a Plug & Print 3-Dimensional Printer allowing both beginners & experts alike to print anything they want using a wide variety of filaments such as PLA, ABS, HIPS, FilaFlex, Woodfill, Bronzefill and many more exotic filaments! Craftbot comes with its own Slicer & Printing software. Craftbot is great for those with no experience in 3D Printing! Craftbot is a Plug & Print user friendly 3D Printer, works right out of the box! Craftbot is an easy to use machine, high degree of tweaking is possible. Craftbot is compatible with any operating system and 3D modeling softwares. From it’s huge build volume to the amazing community of builders you’ll quickly learn why so many people have chosen the Rostock MAX v2 as their go-to machine. From first time builders to seasoned enthusiasts it has everything you’ll need to get involved in 3D printing. From the lasercut framework to high quality injection molded parts it’s built to last too. Re-designed hot-end platform and Delta arms and mounts for worry free assembly. No Sanding Required! Lower parts count means faster assembly time. Top mounted spool holder shortens length between EZStruder and spool, and minimizes machine footprint. New Base enclosures protects your electronics from dirt/dust, and gives your kit a clean, attractive appearance. New Top design provides more rigidity for better prints, and easier assembly and calibration. Over 1300 cubic inches of build volume (11″ Diameter by over 14 3/4″ height). Made in the USA – high quality, laser cut, injection molded and CNC machined parts manufactured by us. EZ Struder and Hot-End set up for 1.75mm filament. High torque NEMA 17 stepper motors. Standard .5mm nozzle – Easily changeable to other available sizes. ATX power supply for safety and easy upgrades. RAMBo by UltiMachine electronics – the best available 3D printer controller. Tinker-friendly electronics and hardware. Many extra places to add your own mods to both. Borosilicate Glass build plate for safety and precision. Appx. 20hrs. to assemble (time varies based on skill and any mods made during the assembly). Our suite of high-performance materials, formulated by our in-house team of material scientists, is designed to work seamlessly with the Form 1+ 3D Printer. From robust, precise prototyping, to a growing library of Functional Resins the Form 1+ can get the job done. With the Form 1+ comes our software package, PreForm. A comprehensive 3D printing solution, PreForm automatically generates sophisticated support structures, while giving you manual control over every aspect of the 3D printing preparation process. Start printing in minutes with the Form 1+ 3D printer’s plug-and-play interface. No calibration or assembly required. The Form 1+ 3D Printer package includes everything you need to get started. The Form 1+ ships with a comprehensive one-year warranty, as well as free, unlimited access to our team of support experts, who can help you with any questions or concerns. Includes Form 1+ 3D Printer, Finish Kit, PreForm software, and 1L of Resin in the color of your choice (Functional Resins excluded).